Our customers send us different kinds of industrial equipment used within the manufacturing sector. We receive alot of mechanical equipment like Servo Motors, Actuators and Gearboxes. The parts associated with that equipment vary, but there’s a common component we see a lot of on the electronic repair side. Touchscreens can be found on robotic teach pendants, HMI devices, CNC control systems and a host of other equipment. This article will help you maintain and keep your touchscreens working for a long time. 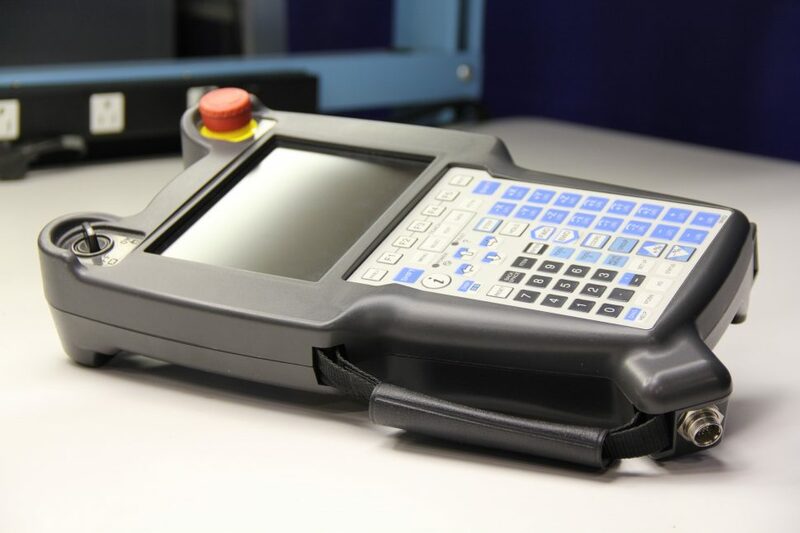 Neglecting your touchscreens can lead to catastrophic damage and downtime on your machines. This component is very sensitive, since it consists of several very thin layers of material against a glass pane. The materials are treated with coatings to help resist dirt, oils and fingerprint smudges. The following maintenance care and tips can help keep your electronic equipment with this vital component in optimal condition. It is best to first attempt to clean with a dry microfiber cloth. Wipe the screen using a circular motion with slight pressure. There should not be a need to press hard on the display. Too much pressure could damage it or the LCD that sits right behind it. If the touchscreen is extremely dirty and a dry cloth did not do the trick, moisten the microfiber cloth with clean water until it is damp and the cloth is not dripping any moisture. A solution of half water and half white vinegar will make for an inexpensive cleaner. Another alternative is a 50 – 50 mix of isopropyl alcohol and water. Never use Windex, bleach, ammonia or other abrasive cleaners to clean the touchscreen. Using these items can remove the protective coatings on the touchscreen surface. Do not spray cleaners directly on the touchscreen. It’s always better to spray the cleaner onto the microfiber cloth instead. Always give the touchscreen a moment to completely dry before using. Pencils, Ink Pens, and paper clips can puncture the sensitive plastic layer and damage the touchscreen. If you prefer to use something other than your fingers to press the touchscreen, try to use a stylus that is made for a tablet or phone. Make sure to use a stylus with a soft tip and one that does not have a hard-plastic pointed tip. Using a stylus can keep the touchscreen fingerprint, and dirt free while also avoiding the need to clean the touchscreen as often. Remove gloves from your hand before using the touchscreen. Since this component is capacitive, gloves insulate and keep it from recognizing any input. The user will then begin to press harder and harder to get the screen to respond. If you want to keep the gloves on, use a stylus instead. Usually all machines have a calibration mode for the resistive display. After a period of normal use the touch screen calibration may change due to dirt, dust or wear.